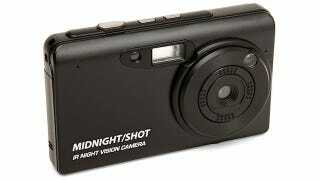 This S95-styled point and shoot, the Midnight Shot NV-1, is the perfect camera for perverts. Why? Cause it has an infrared-night shot mode which can let you see through thin fabric and other materials. It has a regular mode too! But the night-shot mode is where the nudie cam comes in. It gets the blocking filter out of the way, letting all infrared light through while a super bright IR LED "invisibly" illuminates everything in the picture. That infrared light can actually penetrate thin clothing, and since the camera can capture the infrared light, the clothing in the picture turn see through.